Goal: A quality, lifelong education equally accessible to all New Jerseyans, whereby individuals learn to be critical thinkers and engaged citizens with an understanding of and respect for the systems that support civilization (social, economic, and environmental); and which provides students with the knowledge and skills necessary for employment and personal fulfillment. Quality education enables individuals to improve their lives, and gives them a wide range of choice in how they earn their living, spend their time, and occupy their minds. Quality education is also the foundation of a productive economy, an engaged and committed citizenry, and a fully functioning society. New Jersey’s performance has been mixed. On the one hand, our per-pupil expenditures on primary and secondary education are among the highest in the nation, and we have been a leader in new educational initiatives such as charter schools and standardsbased reform. On the other hand, groups in the state have spent years arguing in the courts about the economic disparities between poor and rich school districts, and the resulting court-ordered expenditures have yet to be fully implemented. 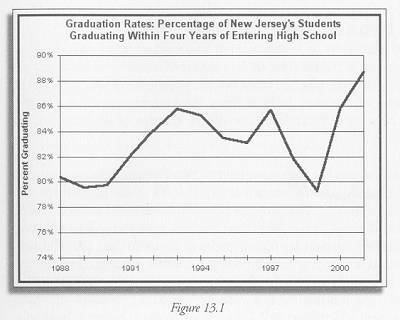 High school graduation rates have fluctuated widely over the past fifteen years. After significant drops between 1997 and 1999, they rose sharply in 2000 and 2001. Teacher-student ratios have improved markedly in the past five years, in part due to a federal program, which provides support to the states to hire more teachers. 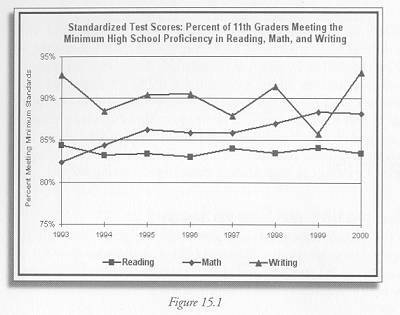 Percent of 11th grade students meeting minimum proficiency standards has risen marginally over the past ten years. 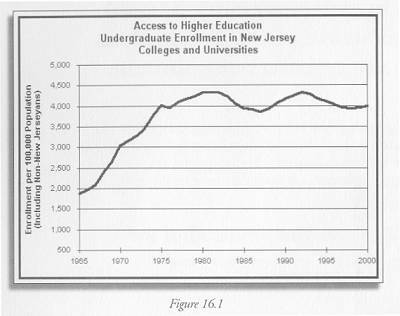 Access to higher education, measured as undergraduate enrollment in New Jersey colleges and universities as a share of state population, has changed little in the past two decades. 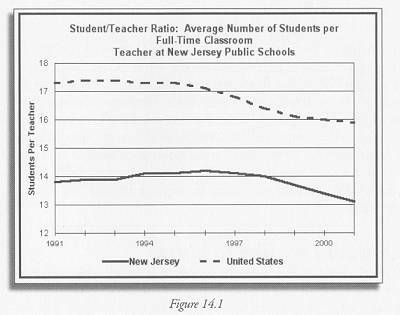 Income inequality in New Jersey is accompanied by significant inequity in access to quality education, which the state has committed substantial resources to redress. As those expenditures bear fruit, it will be important to compare the performance of students in targeted districts with the rest of the population to see whether these expenditures help solve the problems. Education is also about adults as well as young people. 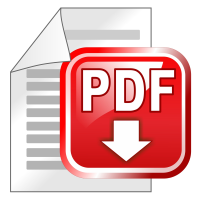 Information on adult literacy, the share of people in the community who do not speak English, and opportunities for people to return to school later in life are important additional measures of our educational system. Public support for education is a major concern as well; tracking federal, state, and local expenditures on public education will be important in the future.